1989-06-01. New. Ships with Tracking Number! INTERNATIONAL WORLDWIDE Shipping available. Buy with confidence, excellent customer service! 2000-02-07. New. Ships with Tracking Number! INTERNATIONAL WORLDWIDE Shipping available. Buy with confidence, excellent customer service! 2014-08-27. New. Ships with Tracking Number! INTERNATIONAL WORLDWIDE Shipping available. Buy with confidence, excellent customer service! 2014-08-27. Good. Ships with Tracking Number! INTERNATIONAL WORLDWIDE Shipping available. May not contain Access Codes or Supplements. May be ex-library. Shipping & Handling by region. Buy with confidence, excellent customer service! 2014-06-04. New. Ships with Tracking Number! INTERNATIONAL WORLDWIDE Shipping available. Buy with confidence, excellent customer service! All God's Dangers: The Life of Nate Shaw. 1975-05-04. Good. Ships with Tracking Number! INTERNATIONAL WORLDWIDE Shipping available. May not contain Access Codes or Supplements. May be ex-library. Shipping & Handling by region. Buy with confidence, excellent customer service! 1984-02-12. Good. Ships with Tracking Number! INTERNATIONAL WORLDWIDE Shipping available. May not contain Access Codes or Supplements. May be ex-library. Shipping & Handling by region. Buy with confidence, excellent customer service! University Of Chicago Press, 2000-05-01. Edition Unstated. Paperback. Used:Good. Vintage. PAPERBACK. 0525562850 New Condition. . New. University Of Chicago Press. PAPERBACK. 0226727742 New Condition. . New. Avon. MASS MARKET PAPERBACK. 0380005085 New Condition. . New. Vintage. PAPERBACK. 0394722450 New Condition. . New. 2000-02-07. Good. Ships with Tracking Number! INTERNATIONAL WORLDWIDE Shipping available. May not contain Access Codes or Supplements. May be ex-library. Shipping & Handling by region. Buy with confidence, excellent customer service! Vintage, 1984-02-12. 1st Vintage Books ed. Paperback. Used:Good. 1983-03-05. Good. Ships with Tracking Number! INTERNATIONAL WORLDWIDE Shipping available. May not contain Access Codes or Supplements. May be ex-library. Shipping & Handling by region. Buy with confidence, excellent customer service! New York: Alfred A. Knopf, 1975. Fifth Printing. Hardcover. Very Good-/very good. 8vo. xxvi, 562, xiv,  pp. Bound in full brown cloth, deckle edge, top edge stained maroon, in illustrated dustwrapper. Very Good+, minor fading and rubbing to extremities of binding, shadow of price sticker to front free endpaper and front pastedown, otherwise internally clean and tight, in Very Good dust wrapper with remnant of price sticker to front flap, front cover has rubbing and wear to edges, spine has a few light stains and chipping to head and tail, and rear cover has 1/4" chip missing from bottom edge and a few short tears and creasing to top edge. Solid copy. Vintage. PAPERBACK. 0525562850 Like New Condition. . Fine. Avon. MASS MARKET PAPERBACK. 0380005085 Like New Condition. . Fine. University Of Chicago Press. PAPERBACK. 0226727742 Like New Condition. . Fine. Vintage. PAPERBACK. 0394722450 Like New Condition. . Fine. Tantor Audio. MP3 CD. 1494554208 *LIKE NEW* Ships Same Day or Next! . Fine. Tantor Audio. MP3 CD. 1494554208 *BRAND NEW* Ships Same Day or Next! . New. New York: Alfred A. Knopf, 1974. xxv, 561, xiii pages. 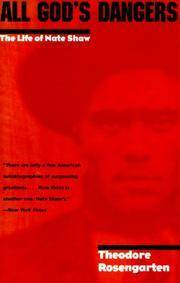 The life story of Nate Shaw, based on interviews with an illiterate black Alabama sharecropper. Book is clean and tight, with some mottling of the color of the cloth on the covers; light foxing to fore-edge and bottom-edge of the textblock; a spot of overspray to both rear endpapers, The clean and bright dust jacket has one very tiny small closed tear on the top edge of the front panel and a trace of light tanning. The dust jacket is now protected in a clear mylar sleeve.. 3rd Printing. Hardcover. Very Good/Very Good. 8vo - over 7¾" - 9¾" tall. Book. Tantor Audio. MP3 CD. 1494554208 BRAND NEW, GIFT QUALITY! NOT OVERSTOCKS OR MARKED UP REMAINDERS! DIRECT FROM THE PUBLISHER!|0.5 . New. Dutton / Signet, 2018 Book. New. Paperback. New and in stock. University Of Chicago Press, 2000-05-01. Paperback. Good. U S. A.: Alfred A. Knopf. Fine/Very Good. 1975. Hardcover. 0394490843 561pp plus index The fascinating biography of Nate Shaw, a cotton farmer born in Alabama in 1885. This account is brillaintly and unobtrusively edited from the 1500 page transcription of his spoken recollections Borzoi edition Dust jacket has small chip on bottom of jacket . Vintage. PAPERBACK. 0525562850 *BRAND NEW* Ships Same Day or Next! . New. Vintage. PAPERBACK. 0525562850 *LIKE NEW* Ships Same Day or Next! . Fine. Vintage. PAPERBACK. 0525562850 Special order direct from the distributor . New. Vintage. PAPERBACK. 0525562850 . New. Vintage. PAPERBACK. 0525562850 Remainder mark . Fine. Jonathan Cape Ltd, 1975. This is an ex-library book and may have the usual library/used-book markings inside.This book has hardback covers. In fair condition, suitable as a study copy. No dust jacket. New York: Alfred A. Knopf, Inc., 1974. Dust jacket a little dust-soiled, price-clipped, showing a little wear at corners, chipped at head and tail of spine.. Third Printing. Cloth. Fine/Good. 8vo. Vintage. PAPERBACK. 0525562850 Brand New! No Remainder Marks or Worn Dirty Overstocks! . New. University Of Chicago Press. Used - Acceptable. 1st Edition. There is a bit of water damage/warping, and some excessive writing and highlighting. Used books are NOT guaranteed to contain components and/or supplements such as: Access Codes or working CD's/DVD's! Ships fast! Expedited shipping 2-4 business days; Standard shipping 7-14 business days. Ships from USA! University Of Chicago Press. Used - Very Good. Great condition for a used book! Minimal wear.